Magnetic Info Pockets feature magnetic backing. Welded, non-rip seams for added durability. Perfect for attaching to machinery, file cabinets, racking and more. Magnetic document pockets are ideal for relocating on steel surfaces, industrial strength magnetic pockets are available for most common paper sizes from A3-A7 in horizontal and vertical formats.tips. Magnetic document pockets are ideal for relocating on steel surfaces, industrial strength magnetic pockets are available for most common paper sizes from A3-A7 in horizontal and vertical formats. Magnetic shop ticket holder can be placed on any metal due to magnetic backing and has welded/non-rip seams for enhanced durability. Ticket holder makes your tickets available at your fingertips. The pockets adhere to all surfaces containing iron and quickly convert any whiteboard into a well structured information board. Pocket with magnetic fixing for presenting A4 and A3 information. For portrait and landscape formats. Information is easily removed and replaced by 2 open sides. Transparent PVC protects documents. Available in 5 colours. Displaying documents in an orderly fashion can be difficult. It is vital to show information to the appropriate people without worrying that the documents will become dirty or lost. The answer to this problem is our Document Display Pockets - Magnetic Backed. 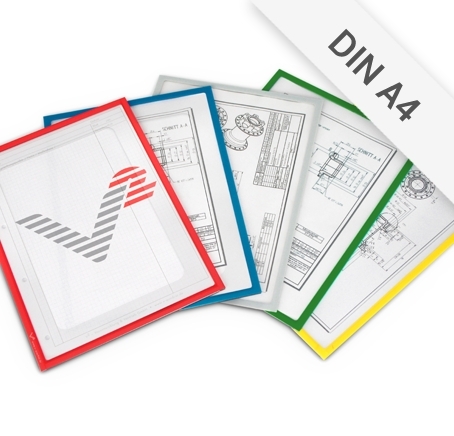 These Document Display Pockets can display the documents whilst protecting them. The magnetic backing allows the pockets to be attached to nearly any metal surface, including steel. The range of colours available for these pockets is: Green, Blue-Grey, Light Grey, Dark Blue, Transparent, Yellow, Orange, White, Black and Red. Other options include our Velcro type (hook/loop backed) of document pockets. The hook and loop backed pockets can transform a felt board or a whiteboard into an information display or company noticeboard. The adhesive pockets can be attached to any flat surface, offering endless options. The choice of colours is as shown above. An additional display option includes our Cascading Document System with standard or mixed colours. This system utilises metal pockets to display a wide variety of documents. The system can be magnetic or wall mounted. Purchase Magnetic Job Ticket Holders at Magnosphere.co.uk and get a better deal! Need high quantities of magnets at the lowest and fairest price possible? Contact our Customer Care Team !